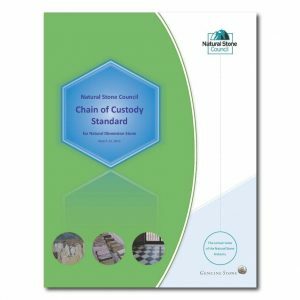 This Chain of Custody standard complements ANSI/NSF 373 – Sustainability Assessment for Natural Dimension Stone, by driving sustainability throughout the supply chain, ensuring that natural stone products that are sustainably produced, are also handled throughout the supply chain in a manner that ensures their sustainability. These requirements are intended to form the basis of conformity assessment programs, such as third-party certification or registration. 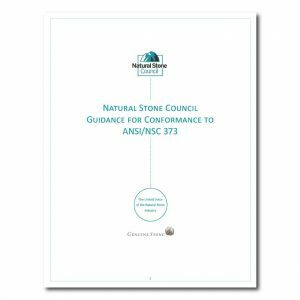 This Guidance for Conformance to ANSI/NSC 373 was developed by Ecoform, LLC for the Natural Stone Council as part of the ongoing efforts of a number of interested parties to document and improve the sustainability profile of natural dimension stone production. 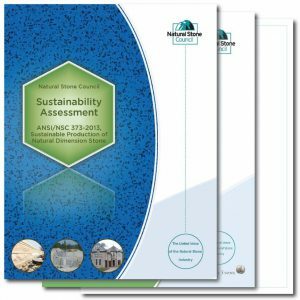 This document complements American National Standard, NSF/ANSI 373 – Sustainability Assessment for Natural Dimension Stone, by providing information, tips, sample forms, and other useful guidance on certifying to the standard. 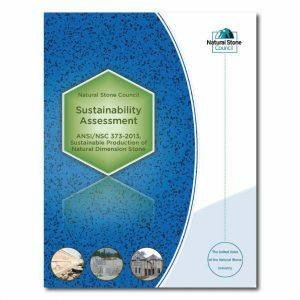 This Document Bundle contains everything a company needs to prove their relevance in the green building market including the ANSI/NSC 373 Sustainability Standard, Chain of Custody Standard, and Guidance Document.